This will be my third year with Hartford Performs and I am very pleased to be part of this family. I love working with kids! I am a community radio and TV veteran, educator and media activist. I teach in the Communication Department at Eastern Connecticut State University and serve as Communication Coordinator for the Center for Community Engagement. I have also worked with younger students from middle and high school levels. Education and serving the needs of students to help them find their paths has been a priority. Decades of teaching and mentoring in many contexts and subject areas have been a joy and inspiration for me to always remember "what it was like." It is the spirit and quality of the personal relationships (above the roles) that energizes and maintains good working partnerships. I am an active producer in radio, TV and print media. I host the weekly “Pan American Express” program on WECS Radio at Eastern Connecticut State University. I am also co-producer/host of an award winning community TV series On the Homefront on Charter Communications. I write a column about local community media channels and programs in the Neighbors newspaper. 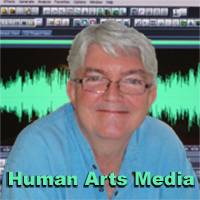 I own Human Arts Media, a consulting and production company serving new business start-ups, nonprofits, co-ops, social/human services and arts organizations. I am a double Goddard College alumnus—with a Bachelor's in media studies and community development and a Master's from the Socially Responsible Business and Sustainable Communities (SBC) Program. In 2008 I was honored to receive a State of Connecticut General Assembly Official Citation Award for 30 years of public service in community radio. In 2011 I received a Wavy Gravy Basic Human Needs Award from the Seva Foundation for media service to the arts and local communities. My work in radio began in high school and continued as a student at Syracuse University in the 1970s. I served on the National Board of Directors of IBS (Intercollegiate Broadcasting System), an association of over 500 college and high school stations for over 25 years. Previously I served as General Manager at WHUS Radio at the University of Connecticut, one of the oldest and largest student/community stations in the country.